We can't stress the importance of safety gear when it comes to riding, especially riding dirt. 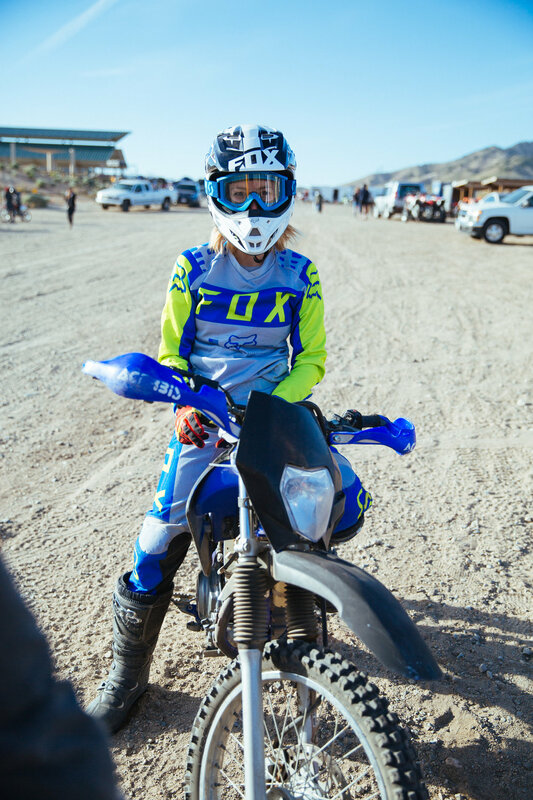 Lucky for Babes in the Dirt, Fox Womens makes the best protection out there and will be demoing gear at Babes in the Dirt 4. Stop by their booth to get suited and booted but please know, there are limited amounts of gear and demos will be rotated hourly so no hoggin' babes! Try it, love it, and return to give everyone a chance to experience the line up. Specifically sized for Women, the Womens Comp 5 uses a Womens last (fit in the foot area) and specific shorter overall height on the smaller sizes. Support and coverage comes from a durable plastic shinplate, medial guard and toe cap. The V1 helmet uses an injection molded polycarbonate shell, internal EPS liner and removable washable comfort liner and cheek pads and meets ECE 22.05 and DOT standards. This proven design provides reliable protection from debris and falls. Optimal airflow, a plush liner, and an exceptional fit contribute to the helmets phenomenal comfort. For an excellent fit, the Fox V1 Race Helmet is engineered in three shells and four EPS dimensions and comes in 6 sizes ranging from XS-XXL. By providing different specifications for each helmet size, you achieve a more accurate and precise fit. The varying sizes and fits mean you can more easily find your perfect match. There is no reason a full-face motocross helmet should overheat, turning the interior into a sweaty mess. The Fox V1 Race Helmet features an advanced ventilation system to keep you cool, calm and focused. With nine intake and four exhaust vents, the helmet provides a rush of fresh air as you ride and allows heat and moisture to escape. The combination of circulating air and a soft helmet liner will help keep you comfortable even in the scorching heat. The Womens R3 uses an anatomically correct injection molded plastic chest plate to achieve the perfect fit on female riders. Shoulder, back, and bicep coverage uses the same durable plastic that is used on the chest plate. It has fully adjustable and removable padded arm guards. This comes in sizes S/M and M/L. Please visit https://www.foxracing.com/us/info/sizechart for more information on sizing.